He could have filled several markers had he chosen to list his other public offices: third president of the new United States, vice president, secretary of state, diplomatic minister, and congressman. For his home state of Virginia he served as governor and member of the House of Delegates and the House of Burgesses as well as filling various local offices — all tallied into almost five decades of public service. He also omitted his work as a lawyer, architect, writer, farmer, gentleman scientist, and life as patriarch of an extended family at Monticello, both white and black. He offered no particular explanation as to why only these three accomplishments should be recorded, but they were unique to Jefferson. 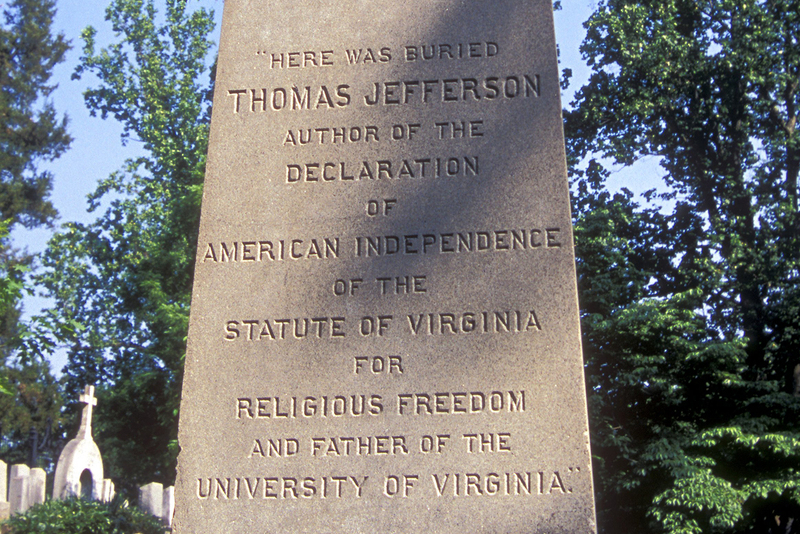 Other men would serve as U.S. president and hold the public offices he had filled, but only he was the primary draftsman of the Declaration of Independence and of the Virginia Statute for Religious Freedom, nor could others claim the position as the Father of the University of Virginia. More importantly, through these three accomplishments he had made an enormous contribution to the aspirations of a new America and to the dawning hopes of repressed people around the world. He had dedicated his life to meeting the challenges of his age: political freedom, religious freedom, and educational opportunity. While he knew that we would continue to face these challenges through time, he believed that America’s democratic values would become a beacon for the rest of the world. He never wavered from his belief in the American experiment. I have no fear that the result of our experiment will be that men may be trusted to govern themselves. . . . He spent much of his life laying the groundwork to insure that the great experiment would continue. In 1768 he contracted for the clearing of a 250 feet square site on the topmost point of the 868-foot mountain that rose above Shadwell and where he played as a boy.3 He would name this mountain Monticello, and the house that he would build and rebuild over a forty-year period took on this name as well. He would later refer to this ongoing project, the home that he loved, as “my essay in Architecture.”4 The following year, after preparing the site, he began construction of a small brick structure that would consist of a single room with a walk-out basement kitchen and workroom below. This would eventually be referred to as the South Pavilion and was where he lived first alone and then with his bride, Martha Wayles Skelton, following their marriage in January 1772. Along with the land Jefferson inherited slaves from his father and even more slaves from his father-in-law, John Wayles; he also bought and sold enslaved people. In a typical year, he owned about 200, almost half of them under the age of sixteen. About eighty of these enslaved individuals lived at Monticello; the others lived on his adjacent Albemarle County farms, and on his Poplar Forest estate in Bedford County, Virginia. Over the course of his life, he owned over 600 enslaved people. These men, women and children were integral to the running of his farms and building and maintaining his home at Monticello. Some were given training in various trades, others worked the fields, and some worked inside the main house. Many of the enslaved house servants were members of the Hemings family. Elizabeth Hemings and her children were a part of the Wayles estate and tradition says that John Wayles was the father of six of Hemings’s children and, thus, they were the half-brothers and sisters of Jefferson’s wife Martha. Jefferson gave the Hemingses special positions, and the only slaves Jefferson freed in his lifetime and in his will were all Hemingses, giving credence to the oral history. Years after his wife’s death, Thomas Jefferson fathered at least six of Sally Hemings’s children. Four survived to adulthood and are mentioned in Jefferson’s plantation records. Their daughter Harriet and eldest son Beverly were allowed to leave Monticello during Jefferson’s lifetime and the two youngest sons, Madison and Eston, were freed in Jefferson’s will. After a two-year course of study at the College of William and Mary that he began at age seventeen, Jefferson read the law for five years with Virginia’s prominent jurist, George Wythe, and recorded his first legal case in 1767. In two years he was elected to Virginia’s House of Burgesses (the legislature in colonial Virginia). His first political work to gain broad acclaim was a 1774 draft of directions for Virginia’s delegation to the First Continental Congress, reprinted as a “Summary View of the Rights of British America.” Here he boldly reminded George III that, “he is no more than the chief officer of the people, appointed by the laws, and circumscribed with definite powers, to assist in working the great machine of government. . . .” Nevertheless, in his “Summary View” he maintained that it was not the wish of Virginia to separate from the mother country.6 But two years later as a member of the Second Continental Congress and chosen to draft the Declaration of Independence, he put forward the colonies’ arguments for declaring themselves free and independent states. The Declaration has been regarded as a charter of American and universal liberties. The document proclaims that all men are equal in rights, regardless of birth, wealth, or status; that those rights are inherent in each human, a gift of the creator, not a gift of government, and that government is the servant and not the master of the people. After Jefferson left Congress in 1776, he returned to Virginia and served in the legislature. In late 1776, as a member of the new House of Delegates of Virginia, he worked closely with James Madison. Their first collaboration, to end the religious establishment in Virginia, became a legislative battle which would culminate with the passage of Jefferson’s Statute for Religious Freedom in 1786. In 1784, he entered public service again, in France, first as trade commissioner and then as Benjamin Franklin's successor as U.S. minister. During this period, he avidly studied European culture, sending home to Monticello, books, seeds and plants, along with architectural drawings, artwork, furniture, scientific instruments, and information. In 1790 he agreed to be the first secretary of state under the new Constitution in the administration of the first president, George Washington. His tenure was marked by his opposition to the policies of Alexander Hamilton which Jefferson believed both encouraged a larger and more powerful national government and were too pro-British. In 1796, as the presidential candidate of the nascent Democratic-Republican Party, he became vice-president after losing to John Adams by three electoral votes. Four years later, he defeated Adams in another hotly contested election and became president, the first peaceful transfer of authority from one party to another in the history of the young nation. Perhaps the most notable achievements of his first term were the purchase of the Louisiana Territory in 1803 and his support of the Lewis and Clark expedition. His second term, a time when he encountered more difficulties on both the domestic and foreign fronts, is most remembered for his efforts to maintain neutrality in the midst of the conflict between Britain and France. Unfortunately, his efforts did not avert a war with Britain in 1812 after he had left office and his friend and colleague, James Madison, had assumed the presidency. Jefferson embarked on his last great public service at the age of seventy-six with the founding of the University of Virginia. He spearheaded the legislative campaign for its charter, secured its location, designed its buildings, planned its curriculum, and served as the first rector. Information about Jefferson's religious beliefs and his promotion of religious freedom. 1. He was born April 2nd according to the Julian calendar then in use (“old style”), but when the Georgian calendar was adopted in 1752, his birthday became April 13th (“new style”). 2. Dumas Malone, Jefferson and His Time, 6 vols. (Boston: 1948-77). I:3-33; Appendix I, I:435-46. 3. Jefferson’s Memorandum Books, James A. Bear and Lucia Stanton, eds. (Princeton: Princeton University Press, 1997). I: 76. 4. TJ to Benjamin Latrobe, 10 Oct. 1809, PTJR:RS, 1:595. 5. “Autobiography” in Jefferson’s Writings, PTJ 6:210. 7. Letter from Abraham Lincoln to Henry L. Pierce, et al., April 6, 1859, John G. Nicolay and John Hay, eds., Abraham Lincoln: Complete Works (New York: Century Co., 1894): 533. 8. Jefferson to James Monroe, May 20, 1782, PTJ 6:185 (ftnt omitted). 9. Notes on the State of Virginia. Ed. by William Peden. Chapel Hill: University of North Carolina Press, 1982. 10. Jefferson to John Adams, 15 June 1815, PTJR 8:522. 11. For coup de grâce and following quote, see TJ to James Madison 17 February 1826, Jefferson Writing, Merrill Peterson, ed. (Library of America, 1984), 1512-15. 12. For Jefferson’s retirement debt see, Herbert Sloan, Principle & Interest: Thomas Jefferson and the Problem of Debt (Charlottesville: University of Virginia Press, 1995), 202-237; for notes signed in 1818, see p. 219. 13. TJ to Roger Weightman, 24 June 1826, Jefferson Writings, 1516-17.